Spine and rear cover are fairly chewed up. 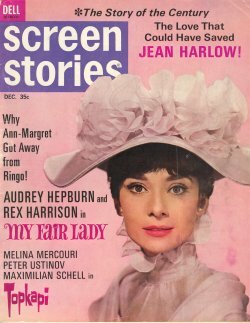 Cover depicts Audrey Hepburn in My Fair Lady. Features on Topkapi, First Men on the Moon, Roustabout, Send Me No Flowers and Jean Harlow, Sandra Dee, Bobby Darin, and Ann Margaret.